We know our readers invest in precious metals in various ways. One way is through ETFs. If you are one of these investors, pay taxes to the U.S., and are holding onto any positions with a loss since the time you bought, here’s a heads-up: if you act by December 31, you can capture that loss on your taxes without losing your exposure to metals. 1) Precious metals prices are low. 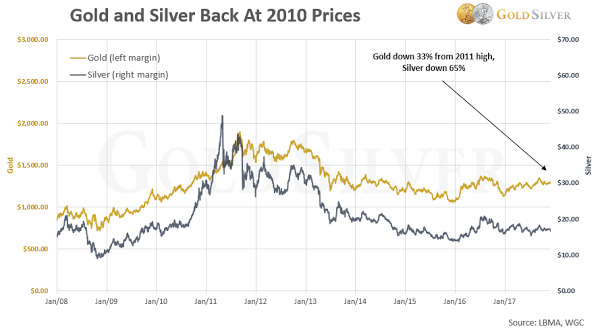 Gold and silver are one-third and two-thirds below their 2011 highs, respectively. It’s bargain hunting season. You can buy gold and silver at the same prices as seven years ago. 2) You can own PHYSICAL metal. Owning a tangible form of wealth not only comes with greater security than a paper form of gold, but it also carries many distinct advantages ETFs and most other investments don’t. I challenge you to glance at the list in that last link and not see how gold and silver bullion can be advantageous to you. And you can pre-order the brand new 2018 gold Eagles and silver Eagles right now. GoldSilver does not provide advice on any tax requirements or issues. GoldSilver does not provide tax, legal or accounting advice Use of any information from this article or any other item on this website is for general informational purposes only and does not represent and should not be construed to be tax advice, either express or implied. GoldSilver makes no representations, warranties, or assurances, express or implied, as to the accuracy, currency or completeness of the content contain in this article or elsewhere on this website or any sites linked to this site. You are strongly encouraged to consult your own lawyer, accountant and/or investment advisor for any tax questions, advice or assistance. To the extent that any of this web site’s material concerns tax matters, it is not intended to be used and cannot be used by a taxpayer for the purpose of avoiding penalties that may be imposed by law.